Wall-mountable design makes it easy to install, keep floor space clear of clutter, and no morecable chaos.3 AC outlets allow you to power up to 3 electrical devices, perfect for desktopcomputers, peripherals, phone/fax/modem, kitchen appliances, standard household electronics. 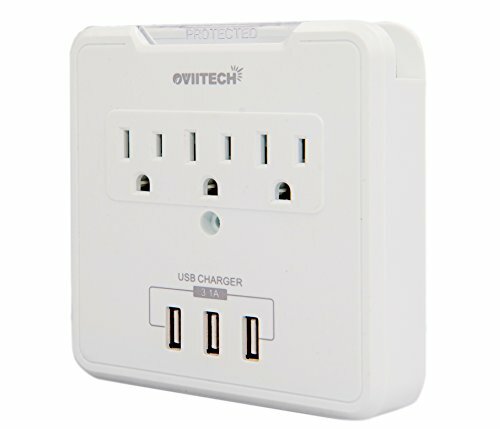 In addition to its 3 AC outlets, this wall outlet features 3 protected USB charging ports. This allows you to easily charge tablets, smart phones, and other USB powered devices. 3.1amps total charging current when charging 3 devices, they deliver the powerneeded for fast, efficient charging. A convenient wall tap design with a phone holder to keep smart phone in a convenient way. Portable size make your travel more convenient. The wall charger is capable of powering and charging up to 6 electronic devices with 3 AC power outlets and 3 USB charging ports. A simple solution to keep your devices charged and powered on.